The sun-drenched region of Campania isn't short on well-known attractions and this trip explores the colourful Amalfi Coast, Bay of Naples, and legendary ruins of Pompeii and Herculaneum. Stride along the scenic Walk of the Gods and travel by ferry along the coast. Our trip starts in Naples, a city of diverse contrasts and one that evokes enormous pride among the locals. Its rich history, staunch Catholicism and endless charm make it one of the most engaging cities in Italy. Tonight you might like to try the most famous Neapolitan cuisine, pizza. The traditional pizzas served here aren't as crispy as in most parts of Italy. They tend to be thinner in the centre so that the fresh tomato sauce collects and soaks into the base. It's normally then topped with a drizzling of olive oil, mozzarella and fresh basil. We start our sightseeing this morning by our Explore Leader taking us on a walking tour of old Naples. We'll wander through the old city streets, open air markets and narrow alleyways that give us a captivating insight into the city's heart, which has gone unchanged in essence for generations. Along the way we will see the round stone turrets of Maschio Angioino Castle, the square seafront Castle Dell'ovo, the main square of Piazza del Plebiscito, the ornate glass covered shopping arcade of Galleria Umberto and the Baroque and Neo-Classical facade of the Royal Palace. This afternoon is free for you to maybe visit the National Museum, which is one of the most important archaeological museums in mainland Europe and houses a prestigious collection of ancient art. You can see antique marbles, bronze sculptures, colourful mosaics and a myriad of treasures from the famous sites of Pompeii and Herculaneum. Alternatively you might like to head underground in the Napoli Sotterranea where 40 metres below Naples' historic centre you can discover an underground world of passageways. The Greeks quarried out the tufa stone from here and used it to build the city walls and temples above, and the underground passages that were left as a result were then used as tombs. During the Roman's reign the tunnels were a bypass to avoid climbing Mount Piedi Grotta, and then most recently during World War II they were used as bomb shelters. This morning we will take the train to the nearby ruins of Herculaneum at the foot of Mount Vesuvius. Buried by the volcanic eruption of AD 79, the city was hermetically sealed under a thick layer of volcanic mud, which preserved a staggering amount of wooden furniture and other organic materials - even fruit. After our two hour guided tour, you'll have further time to explore before we take the train to Sorrento Peninsula, where we will stay for the next three nights. Our luggage will have been transferred separately by road, so we don't need to worry about taking this with us on the train and can just sit back and enjoy the journey. Rather than spending free time at Herculaneum you might like to join a bus trip to Mount Vesuvius. You can then either relax at 1,000m, perhaps with an ice cream, or walk up to the volcanic crater rim at 1,120m along a well-graded cinder track. From the top there are remarkable views down to Naples, the coastal plain and the glistening bay. Vesuvius is the only active volcano on the European mainland and dominates the skyline between Naples and Pompeii, rising up from the flat, fertile landscape. Since the mighty eruption of AD 79, it has had another 18 violent eruptions. The last one, in 1944, surprised the Allied forces and destroyed an entire squadron of 88 B-25 bombers belonging to the American Air Force. We will return back to Herculaneum the same way and meet back up with the rest of our group before catching our train to the Sorrento Peninsula. The Sorrento Peninsula is located to the south of the Bay of Naples and here we can see the rocky cliffs and green rolling hills where orange, lemon and olive trees are grown. The weather is mild year round, so it's ideal for growing fruit trees and a pleasant spot for us to enjoy sightseeing from. Today you are free to relax on the Sorrento Peninsula or perhaps to visit the island of Capri. You can take a train to Sorrento town and then it's just a short walk to the Port of Sorrento to board a hydrofoil ferry across to the island of Capri, which takes about 20 minutes each way. There are then multiple ways for you to explore the island, but we'd recommend taking a private bus excursion to the main sights of Anacapri and Capri. From Anacapri you could walk to the delightful museum and gardens of Villa San Michele and to the Villa Jovis - the ruins of the Roman Emperor Tiberius' cliff top palace with impressive views over the island. Alternatively you can take a boat to the famed Blue Grotto, which is a sea cave where the sunlight shines through it in such a way that it illuminates the waters and makes them appear bright blue. Go into the cavern to witness this natural spectacle. We board the train this morning to Pompeii for a guided walking tour to introduce us to this remarkably well-preserved example of a provincial Roman city. The town once housed 15,000 people and was an important commercial centre, as well as a favourite residence of wealthy Roman patricians. Of course, on one fateful day some 2,000 years ago, this all changed when the powerful eruption of nearby Mount Vesuvius buried the city, preserving the city and its citizens in layers of ash and pumice. On our tour, we will see the extensive colonnaded forum with its Temple of Jupiter and the magnificently-decorated villas, such as that of the Vetii. Human casts of some of the victims trapped by the eruption give an emotive snapshot of this catastrophic event. Following our visit we take the train to Sorrento where you are free to explore or perhaps join a guided walking tour of the main city sights. Sorrento's Baroque Church of Saint Francesco with its cloisters and monastery is well worth a visit, especially as it boasts a garden terrace with sweeping views over the bay. The historic centre and Piazzo Tasso (Central Square) are home to many quaint shops featuring the work of the local artisans and also restaurants where you can sample home-grown cuisine. The city is rich in historical and religious places of interest, including the remaining four gates of the old city walls. Drive to Bomerano where we begin the Walk of the Gods to Positano, which is regarded as one of the best coastal walks in the world. The high cliff path contours west, with magnificent views over the Bay of Salerno and Capri. The trail passes under huge limestone cliffs and above picturesque stone farmhouses until it reaches the attractive village of Nocelle. From here, we descend down an ancient stairway, passing pretty flower gardens, into Positano. A poor fishing village until the 1950s, Positano has grown into a chic town that is still a favourite with Hollywood stars. Positano's colourful buildings are stacked up the green cliff side above its sandy beach. The walk today is Moderately graded, will take approximately five hours and will cover a distance of eight kilometres with a 650 metre descent. The walk can be shortened and end in Montepertuso for anyone who doesn't want to do the steep final descent with a significant number of steps into Positano. From Montepertuso it's easy to take the public bus to Positano to catch up with those finishing the walk. After free time in Positano to relax on the beach or to have a cold beer to reward ourselves on finishing our walk, we take a ferry to Amalfi and on to Minori where we spend the next two nights. Our main luggage will have been brought to the hotel ready for our arrival. For anyone who doesn't wish to hike today you can be dropped off in front of Hotel Eden Roc (on Via Marconi), just outside Positano. From here it's 10 minutes' walk along the shopping street of Via Cristoforo Colombo to town centre. You can spend time on the beach, browsing the quaint shops or unwinding with a glass of wine while admiring the beautiful coastal views before meeting up with the rest of the group at the end of the walk. 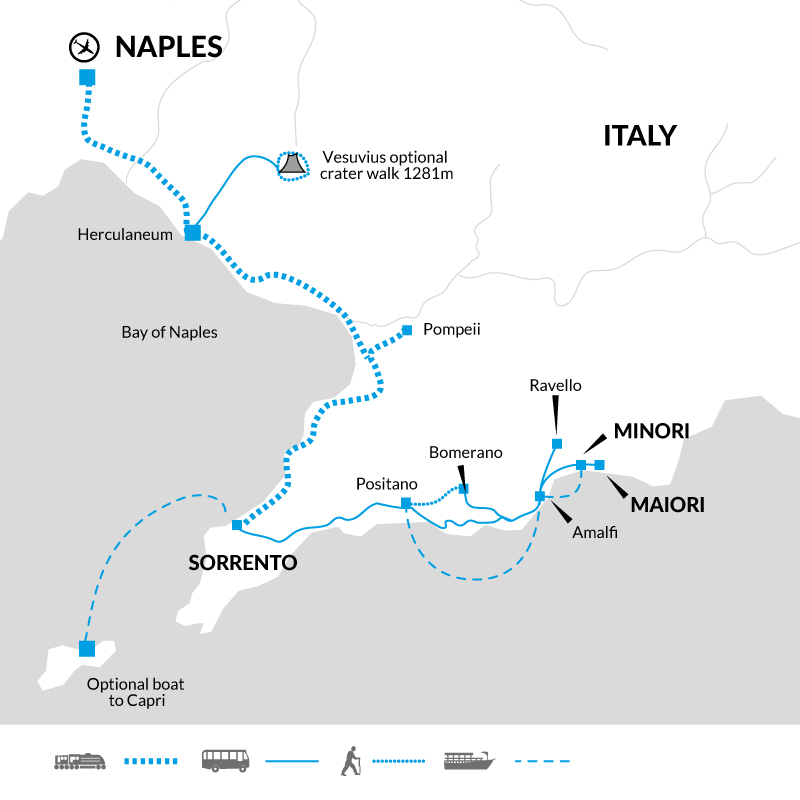 Please note that if you are travelling on the 25 August 2019 then you will be staying in Maiori for the final two nights of the trip, which is only a short distance away from Minori and your trip itinerary is unchanged. During 2018 there has been a partial closure of the Walk of the Gods path due to a landslide. The full path has now reopened, however if it isn't possible to do the entire walk on your departure then you will do a loop walk along the first section of the Walk of the Gods before then following a different path back to Bomerano and from here you will travel by road to Positano to continue the rest of the days itinerary as planned. Today we drive along the coast and get to enjoy the spectacular scenery on our way to Amalfi. Our leader will take us on an orientation walk of the main square. A great maritime power since the Byzantine era, Amalfi went on to reach its pinnacle during the Middle Ages, when it was an independent trading republic rivalling those of Venice, Pisa and Genoa. The beautiful 11th century Cathedral of Saint Andrea dominates the town - a magnificent combination of Romanesque and Saracen design, with an impressive set of bronze doors that hail from Constantinople. At the far end of the town lies the Valley of the Mills, a once important centre of Amalfi's paper industry, that today echoes with the ghosts of its past glories. Next we'll take the public bus to nearby Ravello to go on a brief tour with our leader before having free time to explore more. A tranquil spot located high on a rocky promontory overlooking the azure waters off the coast. The architecture here is a glorious mix of Moorish flair and aristocratic excess and the town's captivating charms have attracted artists and writers to its enchanting streets for generations. We drive back to our hotel in time to have dinner this evening. We drive back to Naples Airport (approximately 1.5 hours) where our trip ends. Napoli Sotterranea guided tours in English €10.00 (duration is about 1.5 hours and tours start every two hours from 12.00-18.00). Guided walking tour of Sorrento €100.00 per group. Hydrofoil ferry to the island of Capri €14.00 each way. Charter bus tour around the islands highlights from Marina Grande to Anacapri and Capri before returning to the marina €16.50 per person (minimum 8 people). At Anacapri can walk to Villa San Michele (1.5kms, 15 minutes per way) €8.00 entrance. At Anacapri can walk to Vila Jovis (6.5kms, 30 minutes per way) €4.00 entrance. Boat trip from Marina Grande to the Blue Grotto is €18.00 per person and last for approximately two hours. July and August are the hottest months and lightweight cotton clothing is best. During spring and autumn temperatures can be lower or drop during the evenings and there is also a stronger possibility of rain. You'll need your swimming costume and light rainwear may be needed at any time of year. A warm fleece/jacket is recommended for cooler evenings and layers for if you decide to climb Mount Vesuvius where the temperatures are considerably lower at the top. We recommend taking comfortable walking shoes for exploring and trainers or sandals for relaxing. You will need to wear closed toe shoes if you decide to climb Mount Vesuvius. We advise taking a water bottle for our included walks as well as sun glasses, sunscreen and a sun hat. In case of emergency we recommend that you carry a first aid kit and a torch. Bring a swimming suit and towel for taking a dip in the sea. We also recommend taking walking poles for the Walk of the Gods, as the path is over uneven rocky ground, some sections are steep and the descents can be a bit tough on the knees. We'd suggest taking a backpack with a waterproof cover for this walk to store your water, a picnic lunch and snacks, any clothing and sun products required, etc. On the three nights of our trip spent on the Sorrento Peninsula the exact location of the accommodation will vary depending on the departure date and will be confirmed to you on your final documentation. Italy: Visas are not required by UK, E.U. Nationals, Australian, New Zealand, US or Canadian citizens. Other nationalities should consult their local embassy or consular office. Naples is a city that is unfortunately frequented by pickpockets, so please avoid wearing valuable jewellery and keep expensive items, your passport and any spare cash or cards in the hotel safe when you go out exploring. At Pompeii and Herculaneum you aren't permitted to take in any backpacks or bags that measure more than 30cm x 30cm x 15cm. There are bag storage facilities at the sites where you can leave bigger items without charge. The walks in and around Amalfi may involve steep ascents/descents which are often stepped. Including the Walk of the Gods, which isn't suitable for anyone who suffers from vertigo. This one week highlights trip offers a great balance between world renowned historical sites like Pompeii with time exploring the famed Amalfi coastline on foot and by ferry. There's also free time to relax and take in the atmosphere or to take optional trips to fill every second of your time. Information Please note that there are two departure transfers arranged at set times for the last day of this trip, which will arrive at Naples Airport at 9am and at 7pm; the transfer from our hotel takes around 1.5 hours. You will be allocated by Explore onto the transfer that is closest to your flight departure time and that allows for a minimum of two hours before your flight for you to check-in. If you have booked with us on a land only basis then you must have provided us with your flight details no later than 14 days before your trip start date in order for you to be included on this transfer service.